"Performance standard testing" at The Dalles, McNary and Bonneville dams on the lower Columbia River showed marked improvements in survival of outmigrating juvenile spring chinook and steelhead during 2011, according to the annual progress report released Sept. 28 by federal agencies engaged in efforts to boost the status of 13 salmon and steelhead stocks listed under the Endangered Species Act. 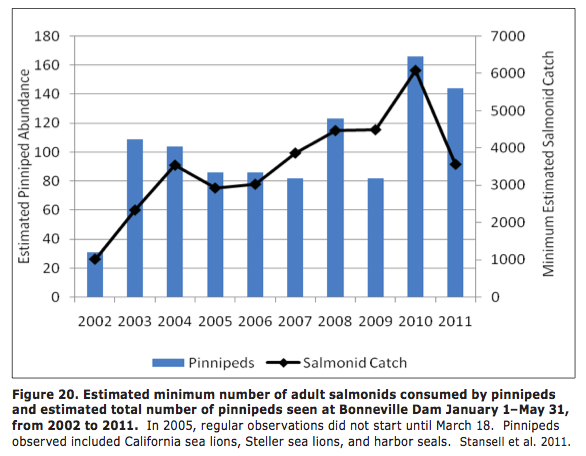 Meanwhile, returns of adult salmon and steelhead to the Columbia River basin showed mixed results in 2011, the report says. The report, which can be found at www.salmonrecovery.gov/BiologicalOpinions/FCRPSBiOp2011APR.aspx, is part of the agencies' reporting responsibilities regarding implementation of the 2008/2010 biological opinion for the Federal Columbia River Power System biological opinion. That BiOp outlines a variety of actions for the 2008-2018 period aimed at mitigating for impacts to salmon and steelhead resulting from the existence and operation of the federal Columbia/Snake river hydro system. The BiOp was drafted by NOAA Fisheries Service, which is responsible for assuring that listed species are not jeopardized. The strategy was created, under ESA mandates, in consultation with federal "action" agencies, the U.S. Army Corps of Engineers and Bureau of Reclamation, which operate the dams, and the Bonneville Power Administration, which markets power generated by the FCRPS. The BiOp strategy has been challenged in federal court by environmental groups and the state of Oregon, who say the BiOp is inadequate to recover listed salmon stocks. U.S. District Court Judge James A. Redden in August 2011 declared NOAA Fisheries' 2008/2010 Federal Columbia River Power System biological opinion arbitrary and capricious -- illegal. He said the 2008-2018 action plan failed to identify specific mitigation plans to be implemented beyond 2013 that assured hydro would not jeopardize the survival of 13 protected salmon and steelhead stocks. BiOps are developed in this case by NOAA Fisheries to assess whether federal actions jeopardize the survival of species that are judged as imperiled under the ESA. Redden said that NOAA Fisheries' "no jeopardy" conclusion regarding the impacts of 14 sets of hydroelectric dams, powerhouses, and associated reservoirs on those listed species was based on measures beyond 2013 that had yet to be properly described by the federal defendants. In his August 2011 report, Redden ordered that the BiOp be bolstered via continued collaboration with federal agencies and with sovereign entities such as the state of Idaho, Montana, Oregon, and Washington, and affected tribes. That fortified BiOp is due by the end of 2013. Redden ordered that NOAA Fisheries file annual implementation reports detailing progress of the BiOp's "reasonable and prudent alternatives" -- a list of habitat, hydro system, harvest and hatchery actions intended for implementation to improve the survival of salmon and steelhead. Others engaged in the long-running lawsuit now have 10 days (from the Sept. 28 submittal of the progress report) to comment. The new report details efforts, and results, from the federal effort to boost the status of ESA-listed salmon and steelhead throughout their lifecycle with hydrosystem, habitat, hatchery, harvest and predator management actions under NOAA Fisheries' 2008 biological opinion. According to the report, "modifications and spill/surface passage improvement appear to be on track to achieve the hydrosystem performance standards -- 96 percent average per dam for spring migrants and 93 percent for summer migrating fish." Those performance standards measure direct survival of juvenile fish as they pass through Bonneville, The Dalles and John Day dams on the lower Columbia River. "The travel time for juvenile salmon and steelhead migrating through the hydrosystem was among the fastest scientists have observed," the report says. "NOAA believes this is likely due to high levels of flow in 2011 and the continued use of spill and surface bypass at the dams." Additionally, the agencies and their partners opened up more than 280 miles of salmon and steelhead spawning and rearing habitat during 2011, the report says. Research has shown that size and connectivity is the strongest predictor that salmon and steelhead will spawn in a specific area. Hatchery and wild juvenile salmon and steelhead that migrate to the ocean through the Snake and Columbia rivers can either be left "in-river" to migrate past the dams or be collected and transported downstream by barge or truck to below Bonneville Dam. "Empirical evidence is used to track the percent of fish that return as adults among those transported and those left in-river to migrate, and generally fish are transported during time periods that yield higher adult returns than in-river migration," the progress report says. "In 2011, less than 40 percent of the Snake River steelhead and chinook were estimated to be transported. Ninety-eight percent of the transported juveniles were assumed to have survived to the point of release below Bonneville Dam," according to the report. "For juvenile fish, total system survival is a combination of transportation and in-river survival. Total system survival fish passage is now higher through eight dams than when fish had to pass only four dams in the 1970s." 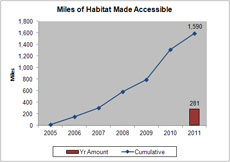 Estimated in-river survival for combined hatchery and wild Snake River yearling chinook salmon and steelhead through the entire hydrosystem (Snake River smolt trap above Lower Granite Dam to the tailrace of Bonneville Dam -- a distance of 512 km) was lower in 2011 than in the previous 2 years. For yearling Chinook, the 2011 estimated total in-river survival was 48.3 percent, which was lower than the long-term (1999--2011) average of 49.3 percent, and the 2010 estimate of 55.1 percent. "However the difference between the 2010 and 2011 estimate was not statistically significant. For steelhead, estimated in-river survival in 2011 was 59.2 percent, which was higher than the long-term average of 41.8 percent but lower than the 2010 estimate of 61.8 percent. "Again, the difference between 2010 and 2011 survival was not statistically significant. To provide some context for these numbers the 2011 in-river survival data indicates that even free-flowing river segments, such as the area above Lower Granite Dam, have substantial mortality. For example, hatchery Chinook survival from release to Lower Granite ranges from 26.4 percent (McCall Hatchery 457 km from Lower Granite) to 83.3 percent (from the Nez Perce Tribal Hatchery, 116 km from Lower Granite). "Wild Chinook salmon survival from tagging site to Lower Granite Dam ranges from 33.5 percent from the Red River fish trap (300km above Lower Granite) to 94.3 percent at the Snake River trap (51km above Lower Granite). Adult fish survival in the Columbia and Snake Rivers is influenced by the operation and configuration of fish ladders at the FCRPS dams as well as sea lion predation, levels of straying, and harvest-related mortality, according to the report. Annual survival rates of listed adult salmonids through defined hydrosystem reaches are estimated based on detections of fish tagged with passive integrated transponder tags (PIT Tags) at Bonneville, McNary, and Lower Granite dams, with corrections for harvest and straying. Survival through the hydrosystem for adult fish is evaluated for five stocks using a 5-year rolling average of annual survival estimates. Snake River stocks are used as surrogates for Snake River sockeye and mid-Columbia steelhead. The 5-year rolling averages (2007-11) for Snake River fall chinook and upper Columbia River steelhead surpassed BiOp performance standards, while the 5-year rolling averages for the Snake River spring/summer chinook salmon, Snake River steelhead, and listed upper Columbia River spring chinook were below adult performance standards. Adult survival of upper Columbia River steelhead in 2011 was the highest among the last five years at 93.7 percent while survival of upper Columbia River spring chinook in 2011 was the lowest among the last five years at 84.5 percent. "High flows and high spill levels, such as those seen in 2011, are known to increase fallback and delay of adults. Increased fallback and delay can result in increased losses due to sea lion predation, and in additional levels of straying and harvest-related mortality," the report says. "These potential factors are being assessed through BiOp Research, Monitoring & Evaluation (RME) actions. The Action Agencies continue to investigate adding PIT tag detection capabilities to adult passage facilities at The Dalles and/or John Day Dams and adding PIT tag capability in fisheries above Bonneville Dam to better understand and quantify unexplained and higher than anticipated losses within those reaches."